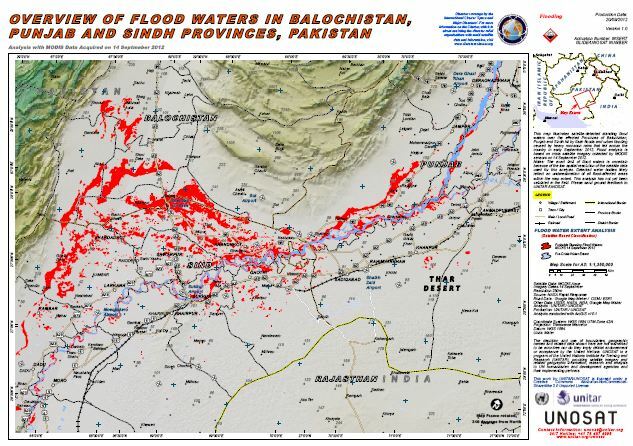 This map illustrates satellite-detected standing floodwaters over the affected Provinces of Balochistan,Punjab and Sindh hit by flash floods and urban floodingcaused by heavy monsoon rains that fell across thecountry in early September 2012. Flood analysis isbased on crisis satellite imagery collected by MODISsensors on 14 September 2012.Notes: The exact limit of flood waters is uncertainbecause of the low spatial resolution of the satellite dataused for this analysis. Detected water bodies likelyreflect an underestimation of all flood-affected areaswithin the map extent. This analysis has not yet beenvalidated in the field. Please send ground feedback toUNITAR UNOSAT.